Witch and psychic Allison Lopez returns in THE WITCH AND THE WOLFMAN and she’s got a brand-new gig! Has a ghost taken over a popular talk radio station? When Allison’s new job as a radio call-in psychic lands her in the hot seat of Psychic Sally, who died on the air, Allie discovers even stranger things are afoot. A ghost haunts the station’s employees and a persistent shock jock gives her the creeps. When further tragedy strikes, police detective Smithy investigates while he gets closer to Allie. 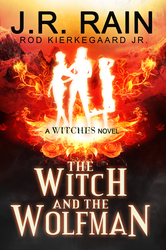 Meanwhile, Allie’s witch sister, Ivy, needs an instant boyfriend, or an evil entity will claim her for his own. And witch sister Millicent’s growing jealousy means Allie has to hide from her inquiring mind.